Discussion in 'Hybrid Z cars' started by Albrecht, May 11, 2018. 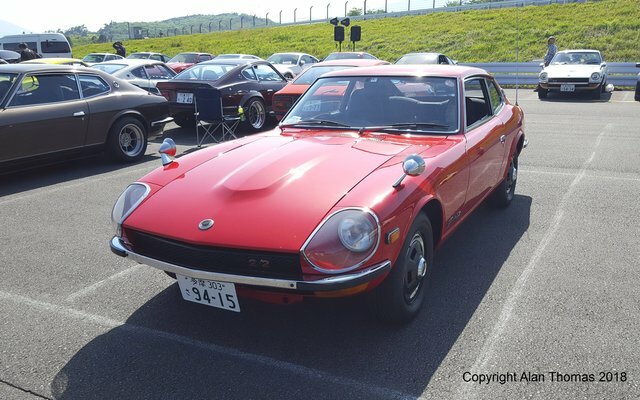 I spotted this car at the 5th May 2018 ADVAN All Fairlady Z Meeting at Fuji Speedway. A car with a Dirty Little Secret. I walked past it a couple of times when the bonnet was closed. Nice to see a C-GS31 still on its original steels and hubcaps. Blingtastic mirror treatment, but great body and paint. Hmmm, why has it got that tax code on its plates? Strange. Oh well. Popped a shot on the phone camera anyway. Walked past again a bit later. Bonnet up. What's that I see under there? Oh! Very cool - when I tried to find a picture of GS31 for the cars section it was pretty hard to find one. Are they a rare sight generally? Generally speaking, fairly rare in Japan. It seems that - like elsewhere - it's the 2-seaters that have tended to have a better survival rate. I would have thought you disliked the hybrid mod to that car? That's pretty cool! Looks really well done and very sleeper-esque. I still have no idea what that engine is or its spec other than it looks like a straight 6 with a crossflow head!? It’s got neo written on the cam cover. As long as modifications are well thought-out, well engineered, well executed and - the killer point - tasteful, I am in favour. I like the car in question because it seems - as far as I can see - to tick all the above boxes. So you see that as tasteful then? All things considered, yes. In fact, the chrome fender mirrors on a GS31 body offend me more than the powertrain transplant on the same car. If we compare it to the Don Muscles mobile (which you and a few others here appear to be cheering-on), it's a no contest in my book. I wonder how well she can use the power with what books like stock wheel / tyre sizes. Did you notice any suspension mods!? I have to agree with you, it's very "tastefully" done and I love the sleeper aspect of it!! Aah that's where we differ then, I think this car being rare should have it's engine. As I've said before a rare E Type wouldn't have a modern Jag engine installed. Also the Don Muscles car IMO has been improved a great deal from what it was hence the cheering. This car has gone the other way (but is a great car) - these things are personal choice. Also why that engine in a car with limited roadholding etc. ? I'd guess as a RB25DE it wont have crazy horsepower, more importantly the torque spikes. 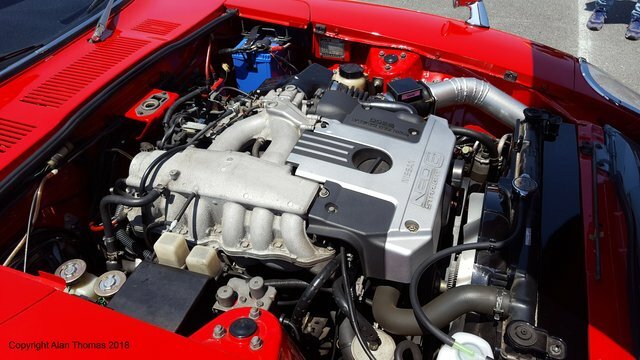 Yeah, RB25DE is 200bhp standard I think, so nothing unusual in Z power terms. 'Rare' doesn't necessarily mean desirable of course. 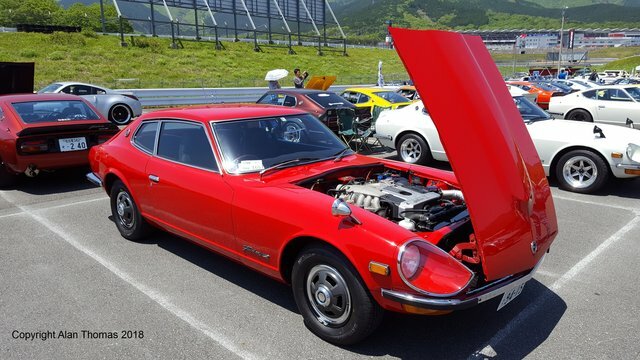 2/2 models are relatively rare in Japan because they were less treasured than the two seater models, so they have a lower survival rate. Personally I wouldn't choose one over a two seater. The car in question has fully reversible modifications as far as I could tell. I doubt it will happen, but if somebody wanted to put back the original L20E drivetrain they probably could with little difficulty. Why that engine? Well, it was hooked up to a modern automatic transmission. It's a cruiser! I bet it wafts around very nicely and for that type of driving the RB25DE Neo is a good choice. Whole engine and trans could probably be bought for peanuts in Japan, and probably cheaper than rebuilding an L20E. The wheels and hubcaps were probably only on for the show (I might not have snapped the first picture if it was sitting on this week's 'cool' wheels...) and I see wheels and tyres as a moveable feast anyway. Like shoes and socks, I always have a few to choose from. For me there's simply no comparison between this car and the Don Muscles car. Referencing what the DM car used to look like is all very well, but I don't personally believe it has been 'saved'. More like a stay of execution if anything. The red car has had a body restoration and repaint to pretty much ex-factory stock condition, clearly with lots of rare OEM parts hunted down and rounded up at some cost. No 'personalisation' body and paint-wise. It's almost bone stock. Two quite different situations and with quite different results. ..............Two quite different situations and with quite different results. Indeed but you started it. Yes. As a reference point for comparison of reaction. You see why don't you? You - and others - apparently cheer on the DM car (fair enough, you must have your own good reasons but I'd guess that was more to do with encouraging the protagonist than the final result for the car itself) and yet you appear somehow critical of, or just indifferent to, the red car.